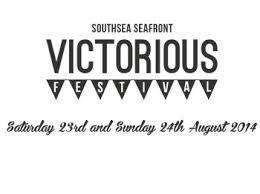 This weekend of 23rd and 24th August, Southsea in Hampshire hosted what has hopefully become an annual event of the Victorious Festival. Having moved this year to the seafront which allowed the festival to be even bigger and better, I think everyone will agree that the change of venue made the festival a total success, especially as Saturday was completely sold out in advance and Sunday wasn’t far off. Having attended on the Saturday it was certainly a brilliant day and the organisers did a fantastic job, hopefully the event will run with the same set up next year as it is certainly one of the festivals to go along and see in the South. I booked the sold out Saturday as there were a number or bands and artists I wanted to see and all of them were away from the main stage. I am sure a lot of people liked who were playing on the main stage but there wasn’t one act I wanted to see and instead went and saw the smaller bands that were much more deserving of an audience in my opinion. Quite possibly all the other festival goers may very much disagree with me but no matter how much popular Dizzee Rascal is, all he does is quite literally drive me bonkers. I saw a lot of great bands today as I was there from the start and I have to say everyone I saw including Jipsy Magic, The Exits, Felt Tip and Van Susans, who were all appearing on the Seaside Stage which became my haunt for most of the day due to a great line-up, were just brilliant. With so many bands over all the stages I am going to pick my own personal top five of the day. Tricorn were the first local band of the day on the Seaside Stage and with it being an early slot I actually got there just after the festival opened in order to see this band. This four piece band set the tone of the day with great rock music and although I hadn’t had the pleasure of seeing the band live before they put on a great show and made a fantastic start to the day, definitely a band to check out and to see live again. Kill Kasper were another local band, and I recently heard them at the Portsmouth Football Club fans day on the opening match, this was a band that were a definite see again. With the crowd growing in size when the band were on, it was obvious this band has quite a following in the city and it is easy to see why. A great set of great rock and with 3 guitars the sound from this 5 piece was absolutely brilliant and I hope to see a lot more of them in the future. The crowd shared a special moment with this band in more ways that just the music. The Butterfly Culture were on the Nevada Stage which had the nice bales of hay as seating again, always a nice touch. A very sizeable crowd were there to see again a local band with plenty of people standing as well to get a view of them. It may have had acoustic on the sign but the band were anything but quiet, with the set comprising of great tracks that were a mixture of rock and alternative. Having recently played Bikes On The Farm and Wickham Festival this is a band that is gaining a lot of support at the moment due to them playing an excellent live set. Andrew Foster was on at the Strong Island Tent playing an acoustic set. If anyone has read my previous posts, he may consider me to be bordering on stalking by now as this is the fourth time I have seen him this year. Stripped down to just an acoustic guitar this time, the set from him was just as fresh as it has been on previous occasions and I never tire of listen to someone this talented, I certainly have got the acoustic vibe where he is concerned. No need for a restraining order quite yet though as this is probably one of the last times this year I shall be following Andrew to an event where he is playing, especially now the festival season is over. Still one of my ones to watch. Mark Morriss has to be my final choice and the highlight of the day. I am probably rather biased about how brilliant he is as I loved his previous band The Bluetones, we’ve gone through adulthood together, and I had to see this very talented musician who was on The Nevada stage, although I was rather disappointed he was not headlining this as he should have been. So having seen him play live for the last two decades I knew this was going to be an outstanding set. Playing a mixture of solo and Bluetones songs, it was a devoted crowd that saw him this evening. He was also on great form with his wonderful witty remarks that also delighted the audience. Despite a litter-picker deciding now was a good time to go through the crowd to pick up the rubbish, obviously this man must have been deaf not to know he was interrupting a musical genius, Mark and the crowd took it in all good humour. The solo songs are just as great from him and it is certainly worth checking out what he has done post-band as he is sounding on top form. With the crowd begging for one more song even though he was over the time allotted to him, he was then joined by the Southsea Alternative Choir which I have to admit I felt a sigh of disappointment across the crowd, we wanted just Mark Morriss but it was still fantastic to see him play another song. The crowd were certainly buzzing from a great set as many left the Nevada stage and this for me was the perfect end to what had been a fantastic day.